A jovial garden gnome leisurely welcomes all into your outdoor space! 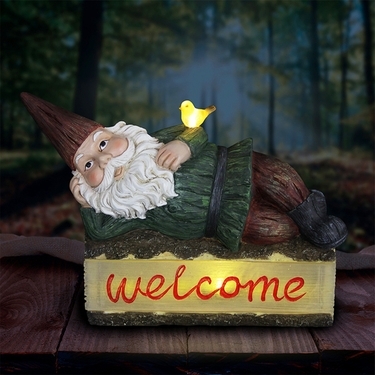 Dressed in his classic attire and adorned with a little bird, this gnome relaxes on a solar log welcome sign. Log will emit a beautiful glow at dusk and is built to withstand the outdoor elements, making a great gift for any garden enthusiast! Size: 16.25" x 6.5" x 14.25"H.